A pearl’s outer layers are composed of nacre, the same substance that forms the mother-of-pearl inside a pearl-bearing mollusk’s shell. Nacre layers are translucent meaning as light penetrates them; it refracts (bends) and reflects back to your eyes. When refraction and reflection occur, they create a series of complex optical effects. Luster is the result of light traveling through translucent layers of nacre and reflecting it back to the eye. The thickness of the nacre, its amount of translucence, and the arrangement of overlapping nacre layers all contribute to luster. Nacre layers that are perfectly aligned stack like a new deck of cards and refract and reflect. If the layers are turned so they go off in different directions, light penetrates, but reflections are scattered. The result is lack of sharpness. Research has shown that mollusks living in cooler water will deposit nacre more slowly and the layers of Aragonite platelets in Japanese Akoya pearls are normally formed more tightly than those living in warmer water. Nacre deposited more slowly tends to be more translucent than nacre deposited more quickly. Consequently, cooler-water pearls, such as the Akoya Saltwater pearls used in Add-A-Pearl necklaces, tend to be more highly lustrous than those from warmer water such as Freshwater pearls from lakes and ponds. Pearl harvesting occurs most often in the winter months when the water is coldest and the luster is most pronounced. Different types of pearls call for an emphasis on different value factors. For Saltwater Akoya (cultured) pearls -- used in Add-A-Pearl Necklaces, luster is crucial. 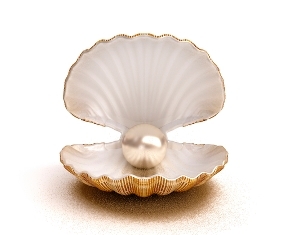 If all other value factors are equal, the higher the luster, the more valuable the pearl. Pearls have always had a magnetic allure. Perhaps it’s their soft, round magical qualities that makes them so appealing and continue to enjoy worldwide popularity.